Today we are having a look at some new pieces in Ashworth‘s 2008 line of golf shirts. The people at Ashworth were nice enough to send along a sampling of the latest Ashworth Men’s shirts as well as some of items from the Callaway Women’s line. Today we will focus in on the Men’s line, and follow up with a look at the Women’s line later this week. This garment needs to be touched to appreciate its buttery softness and lux hand. For the executive who has a high taste level for luxury. An updated traditional style that offers a dressier look and feel, the Micro Pima Performance Fine Stripe satisfies business or the on course apparel needs of the most discriminating consumer. Easy care, resists shrinkage, color fading and pilling, this open sleeve, three button shirt with a knit collar. 70% pima cotton / 30% polyester Pre-embroidered details: white shirt/classic navy, black shirt/white, peach shirt/white, lima bean shirt/ white, marlin/white. This shirt really does have a nice soft feel to it, the material feels quite luxurious. Given that it is in the 60s and 70s here in the North East, I was fine wearing a shirt like this on the golf course. It was very comfortable, roomy and was long enough that the shirt did not come ‘untucked’ at any point during the round. Being a tall guy, that’s often a problem for me with ‘normal’ length shirts. While this shirt would be great in moderate temperatures, I would probably avoid wearing it during the summer months during a round of golf. Not because it is ‘heavy’ or anything, but because I sweat, and have grown used to the ‘moisture wicking’ nature of a lot of the newer ‘tech’ shirts out there. Nice thing about this shirt is that you could wear it off the course as well. It is definitely very sharp looking. 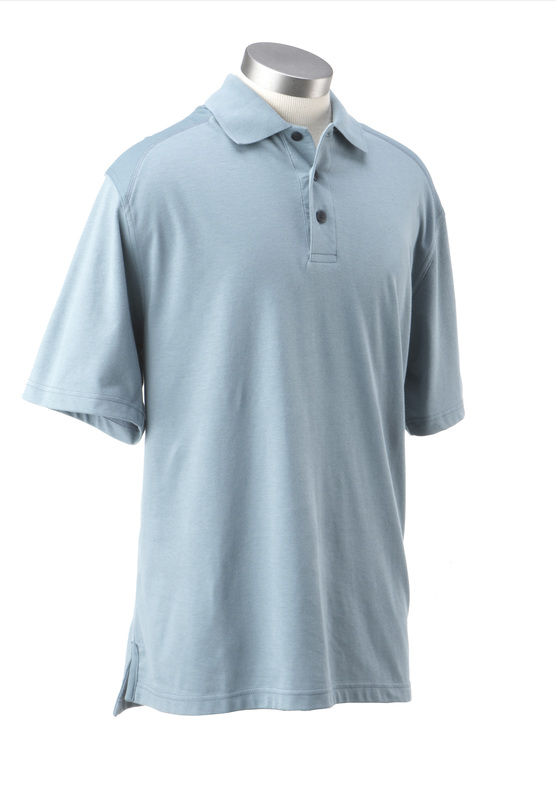 This AWS Layer One Performance Body Mapping Polo is an open sleeve, three button, lightweight polo with a solid flatknit rib collar and dropped tail. It is engineered with seamless texture ventilation to provide maximum breathability and to wick moisture away from the skin to keep you cool and comfortable. Ashworth AWS heat transfer on the right sleeve hem and AWS heat transfer label. 100% polyester. The body mapping polo is more up my ally in terms of 90 degree+ summer golf attire. The moisture wicking material will keep you looking dry even when you feel like you are soaked to the bone. With the lightweight, breathable material, you should also feel much cooler for a longer period of time, hopefully keeping the sweat at bay longer! I have several Adidas ClimaCool shirts, and while I love the fact that they soak up the ‘moisure’, they are a little ‘unstructured’, if that makes sense. They hang very loose on the body, and probably look a little sloppy. The Ashworth shirt has a little more structure to it, feels slightly more rigid, I suppose. In that regard, you can probably get away with wearing this shirt off the course as well. That being said, on the course, the shirt is not restrictive in any way. It is quite comfortable. 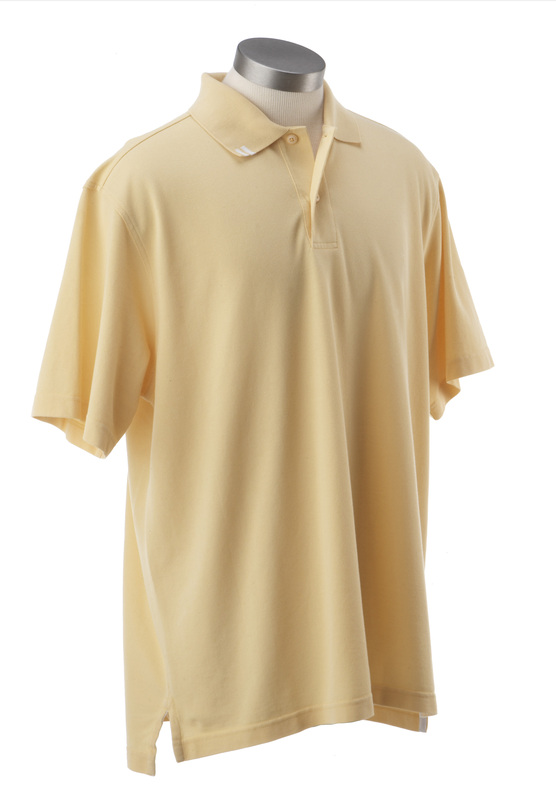 This is a pretty classic looking mesh polo. It will remind you of any number of similar styled, traditional polo shirts out there. It is roomy, comfortable and quite breathable. It is said to be moisture wicking, and to a degree it is. If you are someone who does not sweat a lot, this is probably perfect for you. If you are someone who walks off the course drenched after 18 holes in the hot sun, you may want to look at the body mapping polo. This is definitely a shirt you can wear off the course as well. Performance at a great price! This hybrid polo is the best of both worlds. Cotton rich with a poly interior, this moisture management shirt is perfect for that corporate event when you need to everyone to look great, feel great and show uniformity. 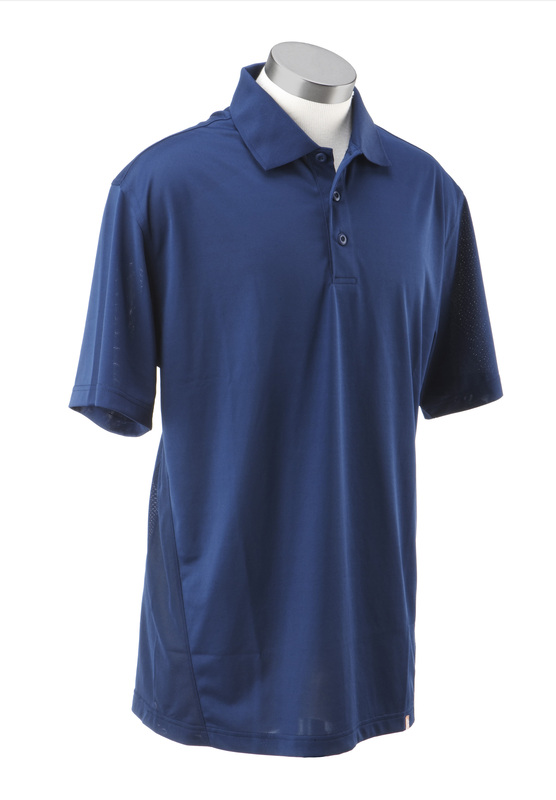 Open sleeve, three button polo features a solid knit collar with contrast rack stitching along the shoulders and textured tonal panels on the shoulders. 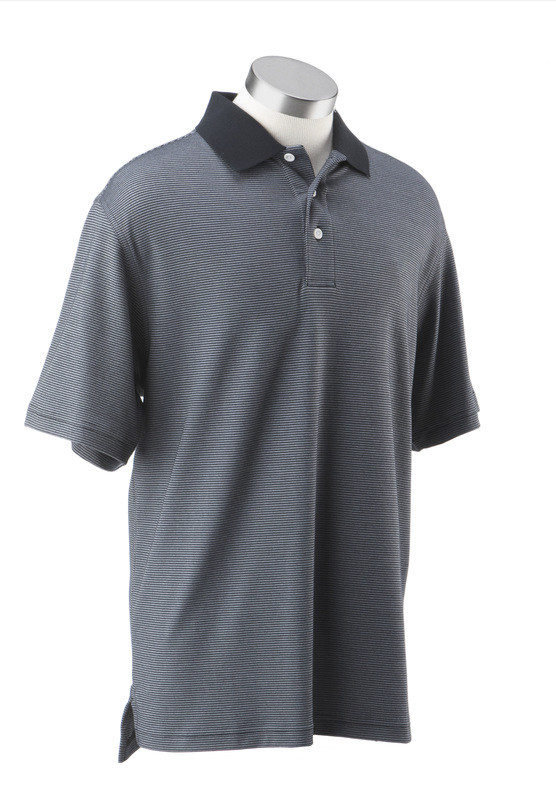 Soft lightweight mesh dry tech polo breathes and dries quickly keeping you comfortable. 53% combed cotton/47% polyester. There is no pre-embroidery on this garment. This feels a little lighter weight than the EZ-Tech shirt. I assume this is due to the cotton/polyester blend vs the 100% cotton in the EZ-Tech. Style wise, this is a classy, roomy polo. You will not find it restrictive in any way. The blend nature of the shirt, however, makes it feel a little less ‘rich’. Again, as with the EZ-Tech, while this is ‘moisture wicking’, it is not to the same level as the Body Mapping polo. It will pick up some light sweat, no doubt. Just do not expect to look dry if you go for a run on a hot summer afternoon! For the price, this is a great option for someone looking for a great looking and performing shirt on a tighter budget. Your local pro shop often will have a great selection of Ashworth clothing, often customized with the logo of your club. 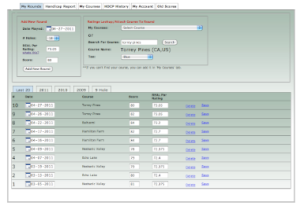 You can also check Golf Galaxy or even eBay for some better deals on these items. We have bought branded Callaway golf equipment from http://www.corporategifts4you.com, and have found their service to be excellent and the range of golf products available is excellent. mens dress shirts have really come into their own ,now haven’t they?